The universe is made up in large part of dark matter, invisible. Camera Obscura is a port of entry into this world. 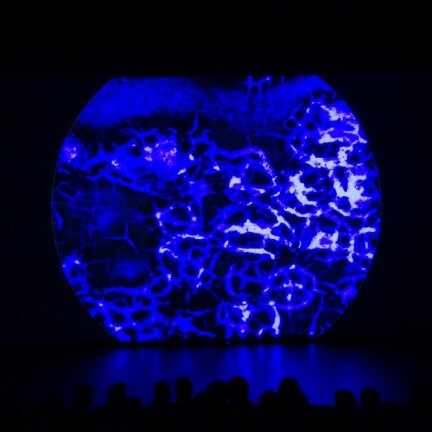 The visual source for this live is made up of around 25,000 high resolution scans of ‘chemiograms’ in 16mm that Jürgen Reble produced in 1995 for the film Unstable Material, created by working on chemical material transformation. The final edit was realized live with a laptop, in associative form: a voyage into a universe of crystallized salts, where rhythm and structure continue incessantly to recombine, generating unexpected results. The music of Thomas Köner accompanies this sequence of morphogeneses, submerging the projection’s verticality with a horizontal and pervasive ambient in which memory, premonition and present are superimposed. Thomas Köner is a multidisciplinary artist interested in the possibilities of combining sonic and visual experiences. He is among the distinct figures of international electronic music, defined in the ‘90′s as the pioneer of isolationist techno, based on his live performances and solos released by the historic label Mille Plateaux. For a while he was also recognized in the club oriented scene for Porter Ricks, a techno music project together with Andy Mellwig. Köner works with sound (above all with bass frequencies), produces video, installations, as well as film and remixes, releasing over seventy cd’s between solos, collaborations and compilations, producing eight soundtracks and music for installations from 1994 commissioned by, among others, Centre Pompidou, the Hayward Gallery, the Walker Art Center and Baden-Baden Staatliche Kunsthalle. His video work has received prizes from Ars Electronica, Transmediale and the Rotterdam Film Festival. Köner returns to Netmage, after first participating with Yann Beauvais and Jürgen Reble in 2000, as well as solo and together with his mentor Asmus Tietchens in 2004 with a reuniting of their project Kontakt der Jünglige. Jürgen Reble is an experimental cineaste active in performance of expanded cinema, installations and film. After the experience of the Schmelzdahin collective (comprising of Reble, cineaste, Jochen Lempert, photographer, and Jochen Mueller, chemist) – authoring over forty films and performances from 1978 to 1989, concentrated mainly on the alteration of cinema tic material – Reble has taken up an individual path closer to a first-person, autobiographical cinema. His expanded cinema works with the dissolution of material cinema in the experience of real-time decomposition in which, starting from found footage and returning to the intervention of chemical agents on the film stock, an aesthetic of instability and incessant mutation emerges. Reble’s imagery, suspended between magic and alchemy, is made from the precarious and unstable, closer more to fleeting, oneiric mental processes than to the presumed stability of the cinematic medium as it is traditionally understood. Reble has presented his work live or in installations in festivals and museums including MoMA in New York, the Louvre Auditorium in Paris, the Amsterdam Filmmuseum and the Walker Art Center.